Before I start talking about other things I've been reading lately--chief among them Grant Morrison's run on Batman that has me enjoying the character for the first time in ages--I figured I would reread the first Incredible Hulks storyline, "Dark Son," which spanned issues #612-617. I did this because while I enjoyed the single issues, I've seen certain criticisms leveled against the series, and even thought of some myself. I can't level all the bad stuff directly at writer Greg Pak, and you'll soon see why. Still, the narrative is less impressive in relation to what came before in the legends of the Sons of Hulk. The first point I have to raise is the characterization of Hiro-Kala himself. He has previously (in my "Dark Son" primer) been characterized as a boy who recognized the dangers of the Shadow People's Old Power and took it upon himself to rid the universe of it. After feeding an entire planet to Galactus, his dead mother even appeared in a vision to him, excusing his actions as being in service to some greater good! 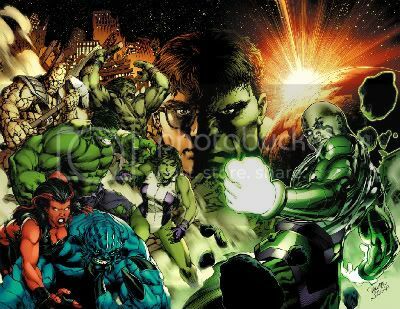 He then attempted to find his brother, Skaar, but was diverted through the Fault (see the Realm of Kings series of mini-series) to the planet K'ai, home to the Hulk's late love, Jarella. There, he used some other energy to tow the planet through the Fault and into the main Marvel Universe. Also, he took the power of the Worldmind, a sentient energy at K'ai's center, and used it to subjugate its people in service to him. Now armed with even more power, he resumed his quest to find his brother, only to ultimately discover that his fragile psyche had created the vision of his mother Caiera as means of assuaging his conscience. He was a child, acting out over the loss of his home planet and his own lack of ability to properly harness the Old Power, so he took information he knew and built lies upon it. There is commentary out there that suggests that the revelations of "Dark Son" ring false, or that they turn the shaky morals of Hiro-Kala's quest into something of stark black-and-white, merely the ravings of a boy who got mixed up in something bigger than himself. In fact, I had to go back and re-read pieces of "Dark Son Rising," the storyline by Paul Jenkins and Andres Guinaldo, to make sense of this storyline. What I found is that the information about the Old Power being unstable comes from Old Sam, and should be treated, until proven otherwise, as canon. There is some manner of problem with the Old Power; however, the exact nature of the problem remains unknown, or perhaps it is only in the misuse of the power that it becomes a problem. ("Power tends to corrupt, and absolute power corrupts absolutely." Thanks, Lord Acton!) If it's the latter, then the Old Power is no different than any other form of energy--if you misuse it, then bad things happen. I like the idea that Hiro-Kala, afraid of the nature of the Old Power, being so young and in possession of the power for which he has been given no formal training, sought solace in hallucinations to excuse the grisly deeds he performed. Certainly, Bruce Banner indicates in his conversation with Hiro-Kala in #616 that he is aware of some problem with the Old Power, but that he has "already begun to figure out how to contain it." He denies Hiro-Kala's ideas that the Old Power is destined to destroy life as we know it. Was what Banner said a lie? Did he know Hiro-Kala was suffering from delusions? Or is there a real problem with the Old Power that will need to be addressed in, say, upcoming issues of The Incredible Hulks? Third and finally, the ending of "Dark Son" is certainly ambiguous, in such a way that not even the finale of Enigma Force #3 can clean it up. While the Worldmind has Hiro-Kala inside it, did they go back into K'ai and find a new star? Or did the Worldmind and Hiro-Kala become the new star? If the former, great! I can accept it but it should have been made clearer. However, if the Worldmind is a new sun, well, I've seen a lot of comic book physics in this storyline, you know? With the planet K'ai approaching Earth in a very "Silver Age Superman" kind of way, and the diversion of the planet occurring in an even more improbable way. (How could the volcanoes generate enough power to divert K'ai from its collision so quickly? And just think about the physical effects to both Earth and K'ai!) But stars can't just be located wherever someone decrees they can go. There are fundamental physical laws to follow. And so, I'm left scratching my head until which time this cosmic riddle is solved. The best thing about "Dark Son" was the human drama and the interaction between the Hulk and his new family. As you can see, the rest of it fell apart rather ridiculously. Gary,I agree with most of your criticisms. I have written article on the Old Power that was on Daily Pop's website a few months ago. As for the loose ends in this storyline,there are quite a few. Some of these loose ends go back to the Realm of Kings mini series. I wrote a brief post on this also. Would you like me to send you the links? There is a problem with the last Hulk issue that needs to be addressed. The ghost of Glen Talbot. First, Cho showed Talbot was not a LMD. Second hia data that showed Talbot worked for the government. We also saw Talbot go into the President’s Bomb Shelter. These facts must be explained. There are some possibilities 1. This isn’t Talbot but a spirit pretending to be him. 2. The data was faked and AIM had just taken over that area for the time being. The problem with this is nothing is gained by making Bruce and his team think Talbot was alive. Or the easy answer is that the Leader outsmarted Cho and the Talbot LMD was undetectable by Bannertech. Since that's the version writer Greg Pak went with when asked ("Cho may think he knows everything, but..."), I'm going with that one. There may be nothing gained by having Banner believe Talbot to be alive, but the "black ops" information cements his alibi when the Talbot LMD is used in Ross' stead in the Intel's plan to assume control of the US government. There would be some vetting of Talbot (at least there would have been if Ross hadn't revealed the LMD and if the Intel's plan had come to pass). Are you saying that when the LMD got power there would be the false information to back him up? The problem is others would know the information was fake and know his was not the real Talbot. There is also the story RAM in the World War Hulks one shot. The research base. That would have to be AIM also. But there is was no reason to go to the extra trouble of doing this to convince Betty. Even though they had the Hulk robot, someone could have taken it from the Red Ghost or gave it to Talbot. Well, you have to remember, this was a scheme cooked up primarily by Jeph Loeb, so don't expect it to hold too much water. The research base (Fort Bowland) was shown in "Fall of the Hulks" to be an AIM facility, with the "marines" there recruited by AIM to become the Hulks that were used in the attempted coup on Washington. It was important to keep Betty on the side of the Intel against Banner, and that meant leveraging her love for her long-dead first husband and engendering a hatred for Banner. Others would know Talbot wasn't real? That may be true, but another hope was probably that the chaos wouldn't last long enough for it to matter. Also, "black ops" can be so off-the-books that very few people actually know the parties involved--it's plausible deniability. Not only that, but it could easily be said in the destruction of Washington by Hulked-out AIMarines, any remaining paper/electronic trail would be wiped out. What you said about Loeb is true. Ratchet and I both think Loeb was not paying attention and messed things up for Pak. You could argue the Intel falsified the black ops data so once they took over it would look legitimate. It is within their ability. Bruce and Cho's game boy/tricorder showing it was not Talbot is harder to justify. They were going to be taken out anyway.